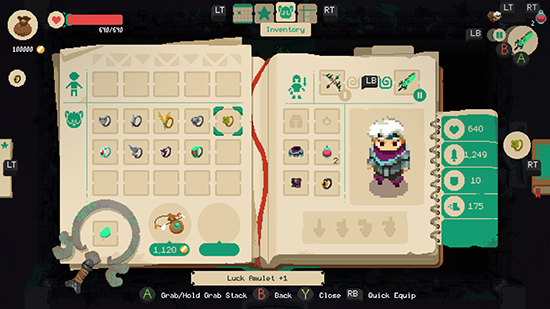 NEW GAME + - Play again the full Moonlighter adventure with more challenging enemies and bosses. To beat the game you will have two new sets of items, the Pirate Weapons, and the Amulets. PIRATE WEAPONS - A new full set of weapons that are crafted with dimensional pirates’ knowledge. Those weapons could be enchanted with elemental effects (confusion, poison, fire or electricity) to alter their power. AMULETS - Mysterious rings found in the dungeons that will offer new abilities for the players. Be careful, though, because most of them can cause some serious side effects! GAME SLOTS - Now, you'll be able to have more than one game slot in the game. QUICK-SELLING MIRROR - Tired of selecting each item to be sold? Now, you'll be able to select the mirror and simply click over the elements you want to sell. Q: That's all cool but what about the Nintendo Switch version? Q: Do you have any more updates planned? A: Yes, we do. Be sure to check out our Roadmap to learn more! Q: Okay... However, that's all for 2018! What about 2019? A: Worry not! We have some secret plans for 2019, too! We are going to announce them when we are ready, though.